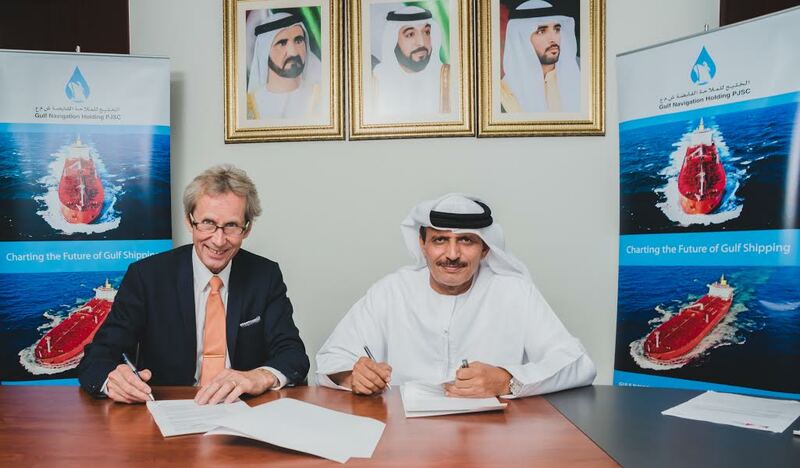 Gulf Navigation Holding PJSC (GulfNav) and Nordic American Tankers (NAT) are pleased to announce that they have signed a new settlement agreement and the long standing debt that GulfNav owed to NAT has now been settled fully and finally pursuant to the terms. The new management of GulfNav have been and are working intensively to clear all historical liabilities and backlog in order to give the Company a new leash of life whereby new horizons of maritime and shipping business can be explored on a more positive footing. This settlement and clearing of liability with NAT marks a beginning of the end of the troubled past of the Company. It is expected that this news will improve investor confidence and widen market interest for the Company. GulfNav is also in negotiations with its other major creditors and is hopeful of reaching fair settlements soon. Khamis Juma Buamim, Board member, MD and Group CEO said “We are happy to have reached this important settlement with Nordic American Tankers and I thank them for their positive commitment during the negotiations. This is a step and an important milestone on the commitment we have made earlier to seek fair and amicable settlements with all our legacy debtors. I once again would like to assure all concerned that past and legacy issues will be resolved and the company will be on a solid ground to navigate the future with full commitment to its shareholders, the market and the industry at large”. Mr. Khamis added that GulfNav has now a fully energized management and that it is equipped with all the means and enablers in order to take a stronger market position by providing quality and cost effective services not only in the chemical tankers but also in other shipping business segments. GulfNav is the only public listed in the maritime, offshore services and shipping company in the Dubai Financial Market and has been accredited ISO 9001:2008 by Bureau Veritas, a global leader in Testing, Inspection and Certification. GulfNav is a holding company with subsidiaries owning a fleet of chemical tankers and offshore support vessels and performing ship and fleet management as well as shipping services.